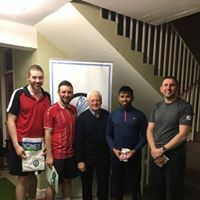 The Committee decided to start a two division league the following autumn – clubs would be invited to compete for a Senior and Junior Cup – both donated by Midlands Branch BUI. Senior – Mountmellick YMCA, Portarlington Parochial, Tullamore YMCA, Edenderry Commercial, CarlowYMCA, Abbeyleix Parochial, Castlecomer and Maryboro YPS. 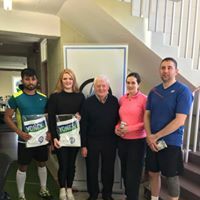 Junior – Portarlington Parochial, Clonenagh, Monasterevan CYMS, Castledermot, Maryboro YPS, Edenderry Parish, Edenderry Commercial, Mountmellick YMCA, Athy Parochial, Carlow YMCA, Athy Social and Luggacurran. The League was divided into two zones – North and South, each with a separate zone secretary to make the draw fixtures and to received the results in their area. The first Senior final played in Portarlington Parochial on March 4th, 1948, saw South Zone representatives, Carlow YMCA beat Mountmellick YMCA by six games to two. The Carlow team was: H. Fennell, R.D.C. Callan, J. Campbell, G.W. Good, J.D. Fennell, B. Tristram, M. Pollock, Mrs. Elliot and Mrs. Ringwood. In the Junior final on March 11th in Carlow YM, Castledermot played Portarlington Parochial, Castledermot winning six games to two. From inauguration in 1947-48 to the next twenty years which saw the S.W.L.B.L. develop and expand. Presidents who served in this period were: G.A. Cashell (Edenderry), D.E. Colin (Clonenagh), Williamson (Carlow Y.M. ), Adamson (Birr), G. Love (Port. Par. ), M. Donovan (Port. Par. ), M.J. Whelan (Carlow Commercial), R. Ringwood (Carlow Y.M. ), B. Newman (Portarlington St. Mary’s), G. Baskin (Maryboro), F. Huber (Athy – 4 seasons), Tom Whitford (4 seasons), W.R. White (Abbeyleix – 3 seasons). The following served as Secretary: R.B. Kelly (Mountmellick), V. Fitzell (Port. Par. – 11 seasons – 1949 to 1960), G. Baskin (Maryboro), Victor Cox (Mountmellick – 8 seasons – 1961 to 1969) and Billy Rushitzko (7 seasons – 1969 to 1976). The League saw an expansion in competitions in this period. The strength to teams like Carlow YM – Senior winners in ’47, ’48, ’49 and ’50, necessitated the introduction of a new Intermediate grade as early as 1950. The first winners of this grade were Carlow Commercial who beat Maryboro six games to two in the final. By 1966 it was considered necessary to split the Junior grade into ‘A’ and ‘B’ because of the ever increasing number of teams competing in the League. St. Fintan’s Hospital beat Castledermot in the Inaugural Junior ‘B’ Final. The League was not without it’s problems in the initial years, on several occasions there was concern for the Senior section and from 1960 to 1965 no Senior section was played at all. Concern was often expressed that young people were not coming into the League and of course the age old problem of fixtures – clubs not adhering to dates, last minute cancellation and clus dropping our of competitions. In 1957 it was proposed that Club Secretaries make their own fixtures, while the next year the then secretary even muted the idea of temporarily discontinuing competitions until clubs came to their senses and started to co-operate. One must remember that the late 40’s and well into the 1950’s was not exactly a time of ‘Economic Boom’ in Ireland, scarcity, ration books, petrol coupons and a general air of austerity prevailed, not a climate conducive to attracting a lot of people to the rather ‘expensive’ sport of Badminton – a sport seen perhaps as being out of the reach of many working people. The records of Stratford Lodge Club in Baltinglass – (the club where Bob Jones played in the 50’s) show annual sub. 15/6, plus 3d per night towards light etc. For home matches members had to bring a contribution of cake or sandwiches towards tea (very important as clubs were very conscious of keeping the standard of their teas high), and when travelling away, had to contribute 1/- towards petrol costs. As well as those expenses the standard of dress was very important – those were the days when it was strictly ‘whites’ only, and whites maintained to the highest standard. Club costs were also high: £1 to affiliate to Midlands Branch, 15/- to enter each team in the League, cheaper ‘Blue Seal’ shuttles £1-12-0 for a dozen boxes, better quality shuttles £1-17-6. Even a score book was 3/6, plus the additional costs of home games – water urn 2/6, light 2/-, even a bulb cost 2/2 and with an average 10-12 members in many clubs it was hard to keep the show on the road! That the S.W.L.B.L. survived the first twenty odd years and entered into the 1970’s as a thriving association was due in no small measure to the calibre of its officers, and also to the dedication of individual club officials who kept the clubs operating at local level. Enter the 70’s with W.R.White as president and Billy Ruschitzo as secretary. Billy was to remain as secretary for seven seasons, serving with President’s Barry Coffey (three seasons), Alex Holland (Carlow Commercial – two seasons) and W.R. White (three seasons). A new record was set when 65 teams representing 34 clubs entered the 1970/71 League. A new grade – Junior C – was introduced to cater for the increase in first time clubs. The League was also stretching out beyond the original 25 mile radius of Mountmellick. The entry fee was also increased to 30/- per team. One of the most successful clubs of the 70’s was Dunlavin, especially at Intermediate level, their ’71 League victory over Abbeyleix setting them up for the decade. Jim Higgins, Paddy Ging, Tom Corrigan, Liam Kehoe, Josie Higgins, Lily Dowling, Clare Coleburn and Nellie O’Sullivan were members of that successful team, and indeed many were still in action when Dunlavin were pipped by Belmont in the ’79 Int. League Final. In the meantime in ’76 they had caused quite a stir when as Intermediate ‘weaklings’ they played up in the Senior Cup, their +3 handicap helping them defeat a well fancied Carlow Commercial Team in the final. A proposal quickly followed and was passed at the next A.G.M. that in the future all plus handicaps be abolished – as you may guess it wasn’t the Dunlavin Club that sponsored this motion. Another extremely successful Club in the 70’s was Killeshin, coming all the way from Junior C to an Intermediate League and Cup double with an almost unchanged team. At one time Killeshin had nine teams competing at the same time in the S.W.L. League. They contested their first Senior final in 1980, playing Carlow LTC who were giving them eight aces. 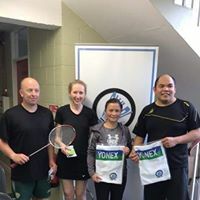 Killeshin led 13-6 in the second set of 4th mixed, just two points from victory, but LTC’s Pat Dunne and Maeve O’Neill fought back and snatched the game 15-13. LTC went on to beat them in the cup and the following years League final, while Ballinabranna beat them in the ’83 Senior Cup Final – a story of what might have been for the players: M. O’Shea, J. Quinn, G O’Shea, L. Doran, C. Brennan, M. Quinn, M. Hennessy and M. Fennell. Carlow Commercial won three Senior titles in the early days of the League. The mid 70’s saw a revival of their fortunes – Intermediate Cup winners in ’74, they won the Senior League in ’75, their first Senior win in 15 years – the team which beat Abbeyleix S.S. was: L. Quinn, T. Dooley, A. Holland, P. O’Neill, M. McGrath, E. Holland, C. Jones, M. Bolger (Geoghegan). The Abbeyleix team was: D. Seale, L. Warren, W. Seale, G. Sixsmith, C. Platt, P. MacEnengry, V. Thompson and A. Deverell). 1979/80 saw Carlow Commercial achieve the first leg of their first three in a row double titles. They defeated Rath in the League Final while Sean Fitzgerald’s Edenderry – who had had a monopoly on the Cup – were their Cup victims. In 1980/81 under the new name ‘Carlow Lawn Tennis Club’ they repeated the double beating Killeshin in both the League and Cup Finals. While the following season with one hand -6, they beat Naas GAA in the League and Intermediate League and Cup winners Ballymore Eustace in the Cup Final. Other clubs also had their season in the 70’s – Ardattin beat Ballinabranna to win the ‘A’ League early in the decade – Ballinabranna beat them in turn in the Leatgue, while St. Fintan’s Hospital won the Intermediate double in ’78. Gerry Hickey (Edenderry) took over as Secretary from Billy Ruschitzko in 1976/77, while Terry Would (St. Mary’s, Kilkenny) replaced Alex Holland as President. Both would serve for three seasons. John Kenna (Leighlinbridge) assumed the Secretary’s position for the 1979/80 season, while Jimmy Lynch (Mullingar) started a three year term as President. The 1981 AGM was delayed for a month because of a petrol strike. When it eventually got underway, Kildare’s Carmel Hester became the League’s first lady Secretary. She served for eleven seasons alongside Presidents; Jimmy Lynch 80-82, Killeshin’s Terry Stone, elected in May ’82, but tragically killed in July of that year; Des Seale (Abbeyleix S.S.) 82-84, Matt O’Brien (Baltinglass) 84-86, Seamus Thompson (Askea) 86-88, Jack Fenelon (Athy RFC) 88-90 and Roy Cobbe (Portarlington Parochial) 1990/91 season. For those eleven seasons Carmel was the South West Leinster League. Dedicated to its development and expansion, she worked unceasingly and unselfishly to make it a success. This was a time when halls were being developed all over the country. Badminton for many clubs had begun in small school halls, many of which had few of the correct dimensions. Many were too low, too short, too narrow, or were straddled with beams. But all of those halls served (and in some cases still serve) badminton well. 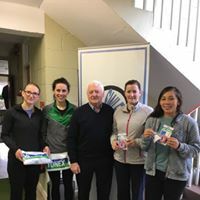 Now new school halls, GAA and Community Development saw an upsurge in large halls, some, like Carlow Tennis Club, were purpose built for badminton, and to these halls people flocked to play badminton during the winter months. Hence new clubs, new faces and new names on cups. Carmel was secretary during the League’s years of greatest expansion. In 1984 sixty-seven clubs had teams playing in South West competitions. In the 1988/89 season eighty-eight teams played in the League and one hundred and five in the Cup. In 1983 a Junior D League was added for total beginners. In 1985 a Premier League was introduced for the cream of Senior clubs to stop increasingly severe handicaps in the Senior League. This experiment only lasted a few seasons. In the 1989/90 season the grades were changed with numbers replacing the old letters of the grades. Henceforth the grades would be numbered 1-7 with 1 being the old Senior. One of the most successful clubs in the 1980’s was Ballinabranna – for the half the decade they were dominant. In 1980/81 they beat Belmont to win the Junior B League, and Timahoe to win the B Cup. The team was: M. Condell, C. Dunne, B. Brennan, E. Miley, P. Hughes, J. Brennan, Ml. Dermody and A. Amond. The same season their Intermediate team – Leslie, Kevin, Seamus and Donal Dunne, M. Landy, L. Byrne, R. Rice and L. Delany defeated Ballymore Eustace to take the League and Cup Double. In 81/82 they lost the Senior League to Cloghan, but won the Intermediate League and beat Killeshin in the Senior Cup final. In 84/85 they won the Senior League, Cup and Intermediate League. The League team; J. Harkins, N. Kane, J. Kenna, M. Miley, C. Dunne, B. Brennan, L. Landy and B. Kelly went on to win the Leinster League Title beating arch rivals Carlow L.T.C. in the final. In 85/86 they won the Senior Cup beating Athy Parochial in the final. The 1984/85 season with over 2,500 people registered to play with 150 teams between League and Cup, was a season of doubles. Killeigh won the A League and Cup, Myshall the B, Kildare won the double at C, while Fenagh won the D League and St. Michaels Portarlington the D Cup. Carlow L.T.C. started the decade winning the League and Cup Doubles in 80/81 and 81/82. In 83/84 they won the Senior and Intermediate League, beating Abbeyleix CYMS at Senior and St. Fintans at Intermediate. They also defeated Kilbride in the A Cup final. That season the Senior team went on to capture the Leinster title, beating Gorey by an ace in the final – L. Quinn, T. Dooley, J. Smyth, P. Dunne, M. McGrath, M. Darcy, M. O’Neill and M. Geoghegan were on the team. In 85/86 LTC were runners-up to Clara at Senior while in 87/88 they were again runners-up in the Senior Cup, while winning A, B and D Leagues. Other clubs to impress in the 80’s were Baltinglass, C League winners in 1980 – O. Cooney, M. O’Brien, J. Fagan, B. Doody, B. Balding, U. McKeever, B. Teehan and B. McMahon, A winners in 1984 – B. Jones, T. Jones, M. Farrell, J. Dolley, W. Wilson, R. Wall, J. Corrigan, M. Kelly and B. McMahon. 1986 C Winners- C. McMahon, J. Greene, O. Cooney, N. Doody, L. Wall, A. Doody, H. Cuddy and S. O’Neill. While in 1987 they won B League and A. Cup – B. Jones, T. Jones, M. O’Brien, M. Farrell, K. Doyle, R. Wall, B. McMahon and M. Kelly. As the decade drew to a close Dunlavin had emerged again – Senior League and Cup winners in 86/87 and 87/88. They filled the void left by the demise of Ballinabranna. Kildare also had their season in the 80’s, winning the Grade 5 in 88/89. They went on to win the Leinster title. As did Ballinkillen who won the D League in 85/86. Askea won their first B league title in 81/82 by defeating Kilbride in the final. In 1985/86, they once again won the B League and A Cup. Kilbride started the decade with the C League. Beaten in the B League final the next year they turned the tables on Askea in the Cup Final to take victory. Beaten in the 84 A Cup Final, they came back in ’86 to win the Intermediate League but go down in the Cup final to Carlow Y.M. Tinryland, Ballon, Clough, Athy R.F.C., Bagnelstown, Oxmantown, Timahoe, Rathangan, Athy Parochial, Goresbridge, Allenwood and Cloghan were others who were to the fore in this decade. At the 91/92 A.G.M. Roy Cobbe assumed the role of secretary, while Portlaoise G.A.A.’s Richard O’Dowd became President. They served together until the 98/99 season, when Hazel Hanbidge (Bough) took over as Secretary and Noel Doody (Baltinglass) was elected as President. The 90’s saw a decline in the number of people playing badminton and the demise of many long established clubs. 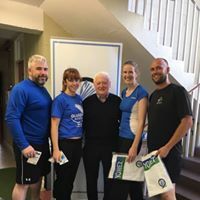 None the less the standard of badminton has not declined, nor has the commitment and dedication to the association by its Secretary and Officers. Dunlavin started the decade well at Senior winning the double in 90/91. A new club from Tipperary – Killenaule – won the Cup in 1992 and 1994 while taking the Senior League in 92/93. Cloghan, the mighty Offaly team, were League winners in 93/94 and double winners in 94/95, while 95/96 saw Carlow L.T.C. again claim the Double. At other grades no one club has been dominant. Many have had their season, Portarlington Parochial winning the Grade 2 double in 91/92, Tinryland the Grade 4 double in 94/95, Carlow LTC the same double in 90/91. 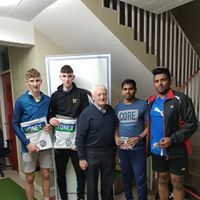 Baltinglass had their most successful season in 96/97, winning the grades 4 and 3 League and Cup doubles, and Bough emerged from the shadows after twenty years to be a dominant force at grades 6 and 7. The most successful development in the South West Leinster in the 90’s has been the Championships. 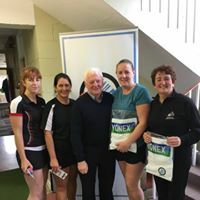 Since their inception in 1993 hundreds have played mens’s and ladies doubles and mixed each January, beginning with four grades and expanded to seven since 1999. In Leinster also, South West teams have become a force for all to reckon with. In 93/94 Killeshin won the Leinster Grade 2 and went on to win the All Ireland while Craanford did the same in 96/97. At the same grade Cloghan won the Leinster Grade 1 in 94/95. Altogether since 1982 the South West has claimed eight Leinster titles and of course the two All Irelands. 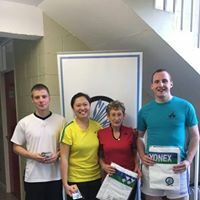 Portlaoise Badminton Club has been running for 5 years and is currently based in Vicarstown, Co. Laois (beside Annanough GAA Club). We have 4 courts and approximately 50 members spread across all grades. We play there every Monday and Thursday from 8pm until late. The club caters for players of all levels and beginners are always welcome. We enter teams in the South West Leinster Leagues and Cups and we have enjoyed great success in the past number of years including winning the South West Cup for Club of the Year in 2017-18. Membership for the season is €70, including all affiliation fees, shuttles for the season and facilities. Coaching is provided from within the club. We also have a juvenile club for kids aged 7 to 16 years which takes place in St Mary’s Hall in Portlaoise on Saturday mornings from 10 until 11 o’clock. We currently have 23 members within the Juvenile club and it has been up and running for the past 3 years. Off the court we run a number of social events throughout the year for our members. If you would like to play, give Niall Davis a call on 086 1598737 or send us a message on Facebook. Make sure to follow us on Facebook to get all the latest PBC updates. Thinking about starting or returning to badminton? Check out the Benefits of Badminton. Men’s & Ladies 2018 Entries Now Open! Following the Shuttlefest, we have our Men’s & Ladies Leagues which are now open for entries. Please click here to download the Men’s and Ladies Leagues team entry form. Closing date for entries is Friday 21st September 2018 by 6pm. As agreed at this years AGM, a fixtures meeting will be held to organise matches for the coming season. The Men’s & Ladies Leagues Fixtures Meeting will take place on Monday 24th September in Athy RFC at 7.30pm. As fixtures meetings are new to South West, please click here learn more about the Role of Match Secretary which outlines the duties to be carried out by the match secretary at the fixtures meeting and thereafter. To find all relevant documents for the coming season which can be downloaded including the calendar of events for the season and dates of the preliminary rounds for the championships, click here. Want to become an SWLBL umpire? 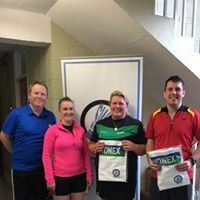 Historically, finals of Leagues & Cups would be reffed by willing volunteers there on the night while Championships finals would be umpired by Badminton Ireland Court Officials who kindly gave their time to travel to South West. 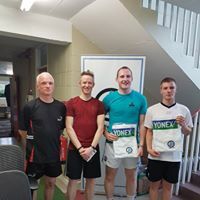 At the 2015 Annual General Meeting of the South West Leinster Badminton League, it was proposed that a group of SWLBL umpires be put together. It was felt by League organisers that having SWLBL umpires would not only make their own lives a little easier, but also give an air of professionalism & occasion to finals of Leagues & Cups. Since 2015, the initiative has gone from strength to strength with approx. 15 SWLBL umpires now in regular rotation. SWLBL umpires learn through a mixture of theory and practice. Many who are players have commented on how learning the rules of the game has contributed to their game & knowledge of rights & wrongs on the court. If you think you would be interested in participating and your club is part of SWLBL – email swlbl1947@gmail.com to find out more. We have had a number of people participate in the initiative and find it was not for them so there is no obligation to continue if you find it is not for you! 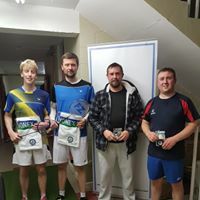 Shuttlefest 2018 Entries Now Open! 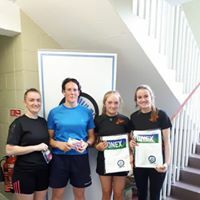 Entries are now open for the Shuttlefest on 15th & 16th September 2018 in Kilcullen Community Centre, Co. Kildare. 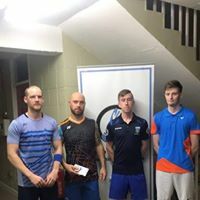 The Shuttlefest is a “kick-start” tournament held by SWLBL in Kilcullen in early September each season. All are graded competitions from Grade 1 to Grade 6 with ladies, mens & mixed doubles competitions in each grade. All events are played as a round robin up to Semi-Final or Final stage depending on number of entries. 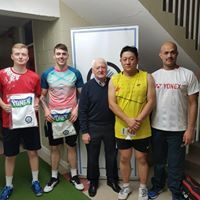 Thanks to Yonex Ireland, each year we have genuine Yonex mats & court gear to make the venue extra special. Rackets Central set up shop for the weekend selling apparel & rackets as well as offering an on-site stringing service. Entry fees are €15 for one event or €25 for two events and entry is open to all BI affiliated players. Last year we had a total entry of 182 players over 18 events from Grades 1-6. Closing date for entries is 10th September 2018 and early entry is essential as the number of entries per event is capped. Click here to enter online. For any queries, email southwestshuttlefest@gmail.com. 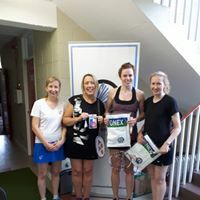 Now that the weather has broken, it’s time to start thinking about dusting off those badminton rackets and getting ready for the season ahead. Our first competition of the 2018/2019 Season is the South West September Shuttlefest which will be held in Kilcullen Community Centre on Saturday 15th & Sunday 16th September. It is now in its 4th year running and each year it just gets better and better. 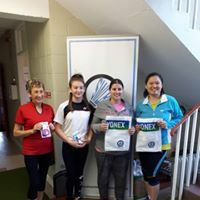 As usual, Yonex Ireland will be there on both days to cater for all your badminton needs. Chelsey Cox (Shuttlefest Organiser) will be in contact shortly with further information on this event. Following the Shuttlefest, we have our Men’s & Ladies Leagues. The closing date for entries for the Men’s & Ladies Leagues is Friday 21st September. Entry forms will be sent to clubs at the beginning of September. As agreed at the AGM, this year we will be having a fixtures meeting for both Men’s and Ladies Leagues and for the Mixed League. The Men’s & Ladies Leagues Fixtures Meeting will be held in Athy RFC on Monday 24th September at 7.30pm. Please ensure your Match Secretary is aware of this date and will be present on the night. Further information on the fixtures meeting will be sent to all clubs along with the entry forms at the beginning of September. I would like to take this opportunity to thank our President, Lesley Cobbe who has worked tirelessly over the past few weeks developing our new website which is very user friendly. All important documents for the coming season can be downloaded from here. You can also subscribe to our Newsletter for regular updates relating to South West Badminton. Click here to access key dates for the upcoming season.